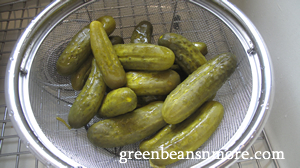 I remember the first time I had these sweet dill pickles. My mother's cousin Edith had made them. I was hooked! I got the quick and easy recipe and made them myself. The next person to get hooked was my husband. 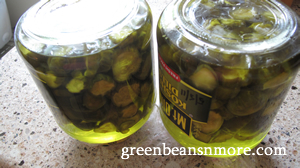 Then I made a jar of homemade refrigerator dill pickles for my friends, and now they ask me to make jars for them! You'll be hooked too! Before this I didn't know how to make pickles and never knew it was so easy. I make two or three jars at one time. Pour pickles and liquid into strainer. Discard liquid. Rinse the pickles and pat dry. 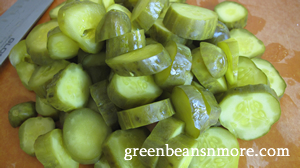 Slice pickles crosswise into 1/4" - 1/2" slices. 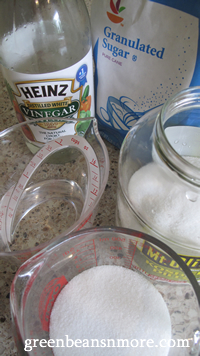 Put sugar and vinegar into the jar. Stir. Put jar into microwave 30 seconds - stir. Microwave another 30 seconds, stir again. The liquid will be just slightly warm. (this step is to help the sugar dissolve). Pack the pickle slices into the jar. You may have to pour off a bit of the liquid to fit all the pickles. Make sure the pickles are fully covered by the liquid. Wipe the rim of the jar. 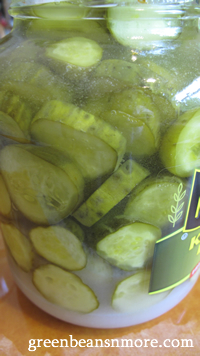 Tear off a piece of plastic wrap and place it over the rim of the jar (this allows you to turn the jar upside down to help make sure all the pickles are in the solution). Wash the lid and replace on the jar. Shake the jar several times over the next few hours, the sugar should be thoroughly dissolved. Put the date on the jar. Refrigerate. Gently shake every few days. I let mine sit 4 - 6 weeks to develop the best flavor.